During the last 2 years the market of e-Сommerce platforms has been reminding a shark-inhabited ocean. WooCommerce has joined the club of unconditional leaders, ProStores and Magento Go have been brutally eliminated while PrestaShop started its offensive on the market of hosted solutions. The changes might come again very soon, and if you think we are trying to hint at Magento 2.0, just turn around and behold LiteCart - a humble newcomer with a promising future. But will it make a difference? LiteCart is an innovative, open source platform built with PHP, jQuery and HTML 5 that offers all basic e-Сommerce features wrapped up in a lightweight appearance. It masterfully combines an advanced functionality, exceptional user-friendliness and easy setup that makes it a perfect choice for small/medium-sized stores. But what truly distinguishes LiteCart among others, is proudly declared in its name - lightness and resource-efficiency. 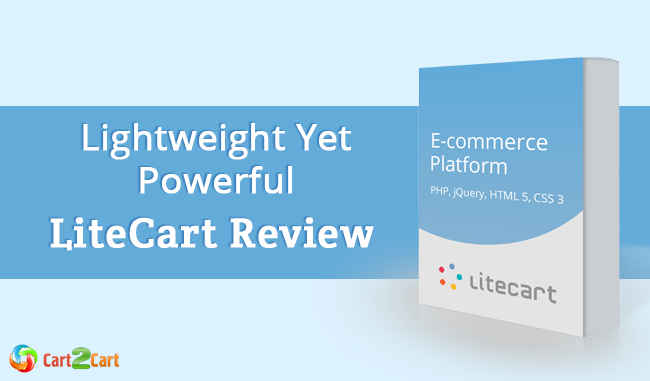 Proving it’s not yet another mediocre platform, LiteCart uses the most robust technologies for the best storefront and admin panel experience. Being light as a feather, the solution relies on the latest HyperText standard HTML5, CSS 3 for styling, jQuary framework for client-side dynamics and PHP for server-side dynamics. All these modern and innovative technologies allow LiteCart to be on a par with the most popular shopping carts out there. Dynamic Loading of Components - increases the store’s speed preventing loading of unnecessary components. This allows merchants to ensure that their customers will enjoy a fast and smooth website performance. Multiple Payment Sub-methods - deprives the need to use separate modules per payment method, as a module can return multiple options. Thus, you'll have a possibility to offer your customers various payment methods using just a single module. Regional Settings Screen - allows to collect information about the visitors via welcome screen feature letting new guests to immediately confirm/select currency, language and country. Automatic Backups - an automatic backup feature that helps to keep your data safe without worrying about it. Dynamic Cache - increasing store’s operational velocity by storing frequently used data. As a result, your e-store will work incomparably faster, leading to a better user experience. Schema.org Microdata - eases the task of marking up pages in a Google-friendly way by using a collection of shared vocabularies that allows you to get higher on search results. One Step Checkout - simple one page checkout page that makes the purchasing process easier and reduces the chances of cart abandonment. Plug 'n Play System Components - convenient way of new functionality implementing through simple uploading of self-adapting and configuring system components. Thereby, it’ll greatly ease your store’s management. After a free LiteCart download, it can be manually installed on a web server like any other open source shopping cart. The solution also provides the possibility of automatic installation using Auto Installer by Softaculous which greatly simplifies a setup process. If you’re willing to perform a switch from your current platform, than you have a possibility to migrate to LiteCart automatically with the help of Cart2Cart. You can have all your categories, products, manufacturers, customers, orders and tax rates moved to LiteCart within a several hours with no technical skills required. Though LiteCart brand is still vaguely known to a wide audience, it mercilessly conquering the hearts and minds of those who gave it a chance. Having a weight of a little more than 4 Mb after downloading, it pleasantly amazes the merchants with all the opportunities this solution offers. If you’re interested in trying out the simplicity and advanced functionality of LiteCart, feel free to use automated Demo Migration and take a look at how your e-store will look like!